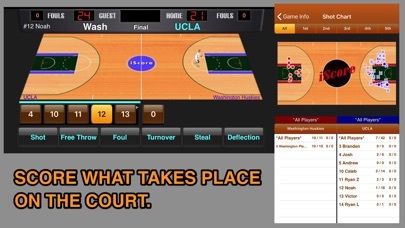 "it’s the most detailed sports tracking app I have ever seen outside of watching SportsCenter" --- 148apps.com iScore Basketball is the easiest, most intuitive way to track a basketball game. With the #1 Basketball Scoring app for mobile devices, you can score youth games, college games and even professional games just like the pros. Brought to you by the leaders in mobile score keeping applications, iScore provides unparalleled data collection, stats reporting and live game scorecasts. Scorekeepers of all levels will love the ease of use and flexibility while the statisticians will appreciate the comprehensive game and season stats that no other scoring app provides. 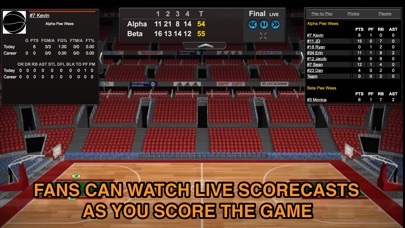 Following the iScore tradition of "score what you see", you will be able to score live basketball games and immediately produce statistics that every coach, player, and team parent loves to see. Track as much or as little detail of the game as you would like. 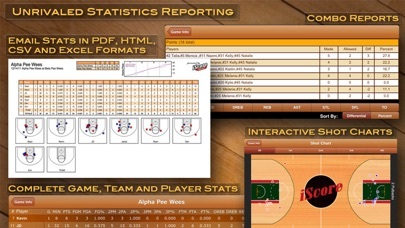 iScore Basketball is so easy to use, even a novice can produce complete and accurate stats. "I had tried the other scorekeeping apps and they assumed I knew things like a blocked three point shot that rolls out of bounds should be scored as a block for the blocker, a missed 3pt attempt for the shooter and a team offensive rebound for the shooter's team. iScore takes care of all that for me ... The coach is delighted now by the accuracy of the stats" -Karen B (Team Mom) Full Tutorials available at http://iscoresports.com/basketball/training.php APP FEATURES: * Intuitive UI - easy to score even the most fast paced action * Track as much or as little as you would like * Full game and season cumulative stats for any number of teams and leagues - see how your team and players performed game to game, season to season, or tournament to tournament * Individual game stats and shot charts for every player. * Unique iScorecast functionality - let fans worldwide watch LIVE as the game is played. Great for out of town friends and family that want to keep up on the action. (additional charges may apply for iScorecast viewing) * Unmatched statistics tracking: Minutes played, complete shot tracking with made/miss + location of shots, % by 2pt vs 3pt vs Free Throws, Offensive + Defensive Rebounds, Assists, Steals, Blocks, Deflections, Turnovers, Personal Fouls, Charges Taken, Total Points, Averages per game, +/- (PM) * Complete shot charts for every player and entire team * Foul history report - see all fouls for the game at a glance * Play by Play reports - coaches can review entire game to see where practice is required * Robust Timeout tracking - 30 second, Full and Media timeouts with period by period timeout * Full Undo and Redo capability * Complete post game editing - edit/add/remove events + subs post game * Data Sharing - copy teams and games between devices to share information with other scorekeepers * Email a unique "Game Report" that includes stats, shot charts, and Game Flow for the game in a beautiful PDF format * Twittercast - send game scores out as tweets * Ability to score with or without a Game Clock * Combination stats reports. * Track one or both teams. * Email all stat data in CSV, Excel, or HTML formats * Free Export to MaxPreps * Manual stat adjustment/creation - Season already started? Create a new game and use Adjust Mode to enter stats to date * Optional Team Websites provide a fully customizable website with easy updates IPAD SPECIFIC FEATURES: * Choice of Scoring Mode - Game, Coach, or Adjust. * On screen player photos in Coach Mode. * "Full Screen" vs "Split Screen" scoring. * Connect to External Monitor - allows fans to see scoreboard on a monitor connected to your iPad while scoring! * Optimized Portrait and Landscape views Perfect for youth basketball, high school, college, and even professional games. 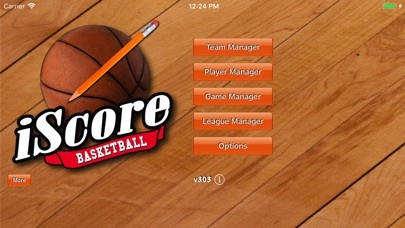 Elevate to the next level with iScore Basketball! Love the basketball and baseball apps both very much! This app needs to be used on iPad. The phone is far too difficult. Seems like they stopped updating it though. Baseball more advanced. Paid for the app back in the day so grandparents could webcast games. Now they give the app away free and people watching have to pay. I've had the app for years and they've spent very little time or money making any real improvements. Now we have to pay again to get what we paid for originally. I'm glad this is the last summer of bball for us. I would never use this again. At a tournament this weekend we needed something to serve as a backup to untrained teenage scorekeepers. This app was set up in less than 5 minutes and does amazing things. It is intuitive to use. Corrections were a challenge to figure out mid-quarter, but this app does all we need and more than we can use. We tried to buy it, and it seems the app itself is actually free! If we want the website next season, it’s there for purchase, but the app itself was perfct for the tournament. Thanks, iScore! I have used this app for years and like it a lot. Pretty easy to use and modify to your liking. Problems - no shot chart for opponent when playing away and no shot chart for opponent sent with the stats when you send by email. Also don’t like the clock starting automatically after free throws. Please adjust the display to fit with iPhone 7plus. Have been a long time user since 2010 and my 3GS, but now on my 6S Plus, iScore still maintains the small score keeping dimensions from the smaller 4" iPhones. A few bugs in various team player add functions where entered data disappears going back and forth between controllers.